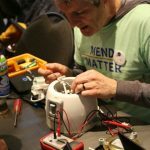 The Repair Cafe for a second time has come and gone. 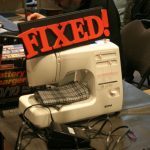 And with that the Repair cafe moves along to another community to aid where the can to repair wayward electronics. 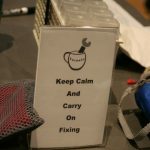 In the mean time here is some photos from today’s Repair Cafe. Fixed the lining in her coat. Fixed the sewing machine so it works once more. 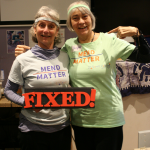 Fixed so the shirts fit better and the remnants are now styling head bands. Hacklab is proud to be hosting the official launch party for the new Toronto Studio Commons! “Toronto Studio Commons is a diverse group of independent artist studios, workshops and collaborative spaces, sharing a common goal in promoting artistic and creative expression in our city. Founded by a new generation of artists and entrepreneurs, TSC represents a wide range of operating structures, such as open studios, galleries and/or shared spaces. 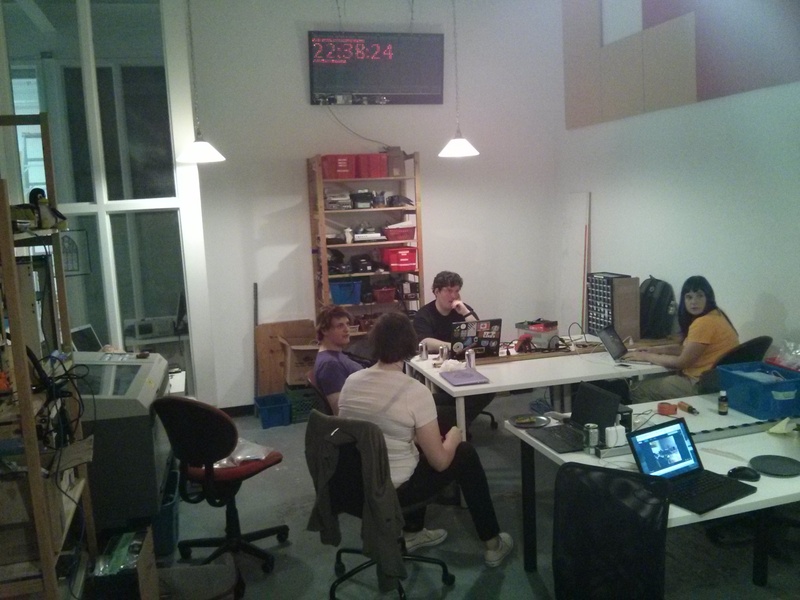 As previously announced, hacklab will be moving to new much larger digs at 1266 Queen Street West. We’re interested to find out what people who are not currently members of the space would like to see us have. Here’s a quick 2 minute survey you can take to have your say! Totally anonymous, feel free to express yourself. 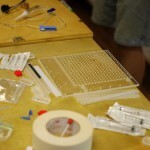 Please send a link to anyone you think would be interested in hacklab! 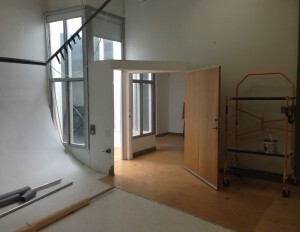 Some of you have already heard, word is getting around, hacklab has signed a lease on a new space! We’ll be moving to 1266 Queen Street West, units 6 & 12. It’s at Dufferin Street, in Parkdale. 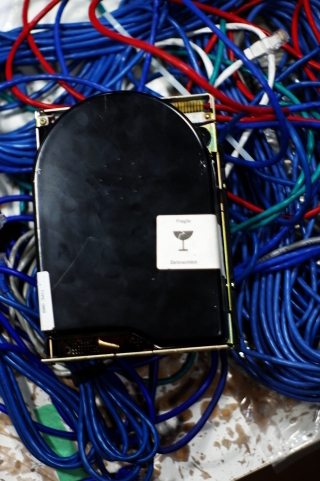 The two units together have a HUGE amount of space, roughly equivalent to 5 existing hacklabs! Our lease starts Sept 1st, but we’ve got possession early to do some renovations. 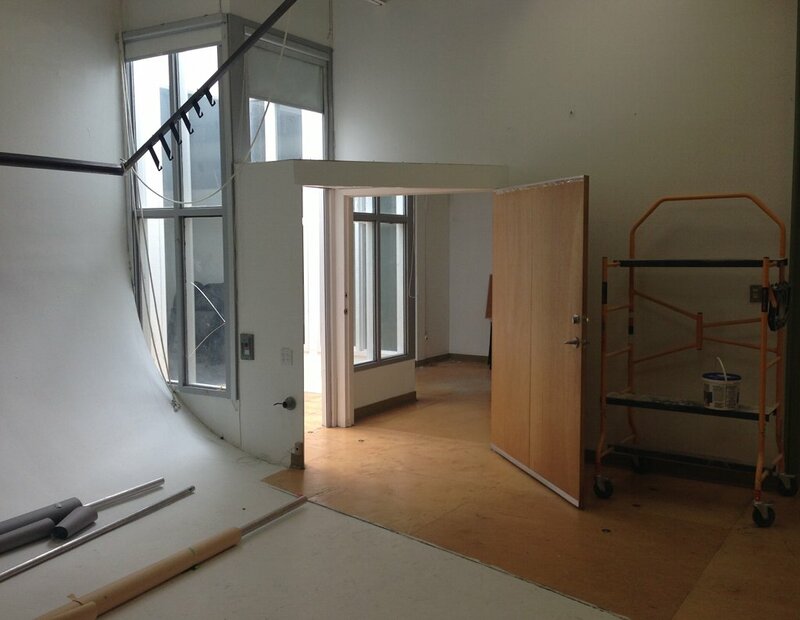 Many hacklab members are extremely excited about the potential of the new space! 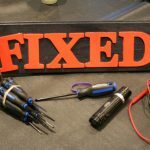 Hacklab open house will continue to be at the current location (170A Baldwin Street in Kensington Market), likely till at least Mid-September. Every Tuesday evening 5:30pm-late as always. We will let you know when the location of the open house changes. Thanks to everyone who supported our indiegogo and all of our activities throughout the last year – we wouldn’t be in a financial position to do this without you! I’ll be lasering up our thank you plaque soon! If you’d like to contribute towards our moving expenses, we’re always happy to take donations, please click the button at the bottom of this page or just come to our open house and put some money in our donation box. We’re also looking for all kind of in-kind support (got some extra furniture? ), please contact us. Todays post is not quite what you think it is about, but the chosen title will make more sense as you read along. 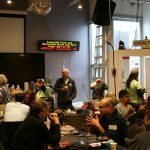 Hacklab has been around for a while on the maker/hacker/creator/incubator scene and could be seen as one of the original terminals that now make up part of the Mesh network that is our community in Toronto. 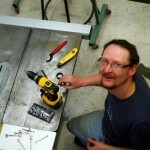 As I have witnessed over the few years I have been visiting, making, and working within the community. I have seen how those who come to explore discover us or other parts of the community, and bounce around absorbing and finding the right fit. 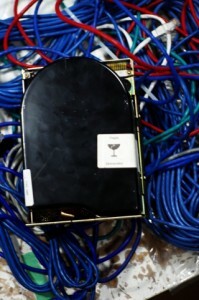 Many times those who are new to the community or those who are well versed in the community, have multiple links to the Mesh network by frequenting many of the other spaces beyond Hacklab’s walls. This is where I should note at times Hacklab has played host to other new groups in the community, be it the Haskell Users group, or the occasional DIY Bio group. I hope that Hacklab and other spaces in the community will play host to other groups that will ever increase the diversity of the community Mesh. The cross talk between each space informs one another through the sharing of ideas and others being partially mixed into others creating a noise of ideas and thought, spawning new projects that use the resources available at times of multiple spaces, and memberships. To get a better idea of the diverse community that has flourished within Toronto, I would like to draw your attention to a side project entitled Hacking-the-city, of mine that has been slowly creating an larger picture of the community, and those which influence and flow into others within the Hacker community. I have used pinterest simply to keep it semi organized and to attempt to create a visual idea of the community, as well as small description of the organization. If you as the reader can think of an organization, group, or other part of the community that I have not mentioned please tell me so I can pin them to the board. Cross talk may take some time to get really going, the intention is to visit other spaces with members of the community that frequent the lab and to get a sense of the other parts of the community threw photography. This I envision being a little difficult and taking time due to how does one accurately depict a community, or project via a lens. This is a constant challenge at Hacklab due to some projects are not easily conveyed. How does one take a photo of someone programming and convey what it is they are doing, or what the program is? To stage a photo or to shoot candid, which method is the more truthful and accurate? I look forward to this project and hope to share what I capture with you all soon. 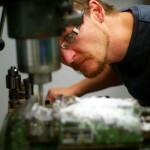 This past weekend the folks at The Ultimate Workshop, played host to some Hacklab members to work on a joint project. See below for a sneak peak at an upcoming blog post on the Retropopulator. New part of the Reropopulator just had a hole drilled into it. Just getting ready to assemble part of the Reropopulator. Partslayed out for the Reropopulator. Photo of the week; Out of this world. 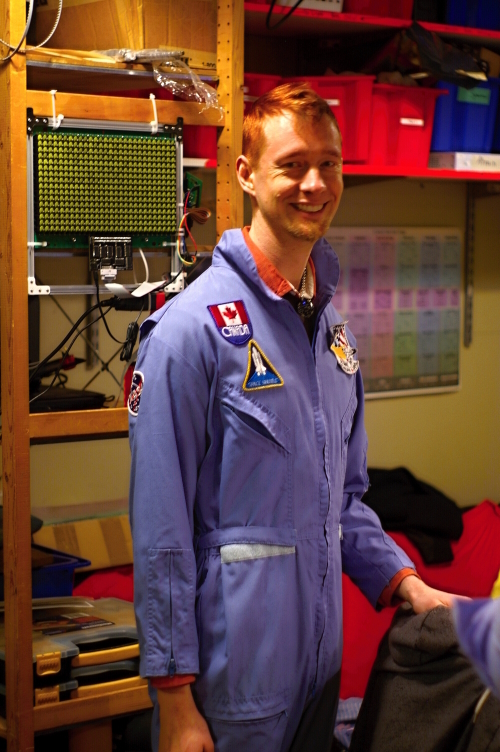 Recently, one of our members surprised us all by showing up to the lab with a flight suit. As the title of today’s post reads. This post is a little out of this world. 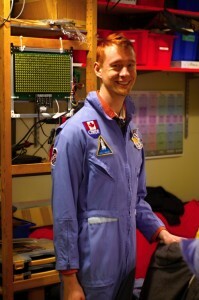 Recently, one of lab’s members surprised us all by showing up to the lab with a flight suit he had obtained. We were all a little curious about its origins and the patches upon the suit. 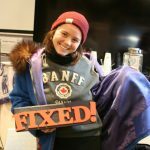 It turned out that the Ontario Science Centre had decommissioned this suit and this lucky member had been on a tour of the Science Centre at the right time to receive it. The patches on the uniform are a bit revealing. All of them seem to be authentic and telling as well. 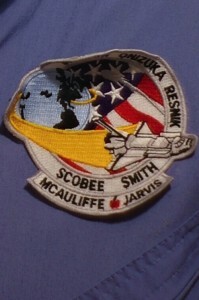 The patch on the right side is from the Challenger Shuttle Mission in 1986. I think this has been a little gem the Science Centre has had for many years. To include mission badges from such a tragic mission that ended in the loss of the entire crew on a flight suit that was meant to help educate and teach science has been a touching tribute. A tribute that has allowed the ideas of exploration and those who have been lost in its pursuit to be still part of it. Now the flight suit lives on with a member of our own exploration community. I hope that it can still help foster ideas of exploration, learning, curiosity, and education with its new owner. 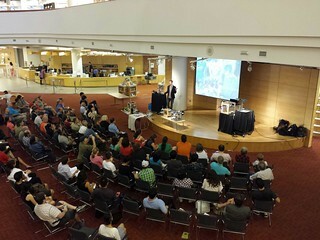 As we mentioned, hacklab gave a talk about 3D printing, hackerspaces and maker faires to the Toronto Reference Library a few weeks ago. It was extremely well received! We showed off 4 different 3D printers, actually operated one to print an object live (under a magnifying camera which streamed to the projector! ), passed around a large number of 3D printed objects, and also demoed a variety of wearables projects. About 100 people saw the talk, and judging by how many stayed around to ask questions, and then how many came to hacklab to get a tour, we really made an impact! The library put a blog post about it themselves: An Evening with HackLab.TO at the Toronto Reference Library. I’ve also uploaded a variety of photos to my flickr. Thanks go out to Norm, Jammies and Rob for making this event a big success. We’re looking forward to continued conversations with Toronto Public Library about their plans to have something like “maker spaces” inside both the Toronto Reference Library and the new Fort York branch. Yes that’s right, we’re moving next door to a larger space! Our Hacklab.to is moving indiegogo campaign is off to a great start, with $870 pledged only 2 hours in! We have awesome swag rewards including stickers, t-shirts and mugs. We’ll be using the money raised to help fully equip the space: everything from tables and chairs to new tools for the shop to kitchen essentials. Go pledge now! Quantified Self is a really cool movement of people doing self tracking using technology — for example, one might use a device to monitor their heart data or when they’re at home, and then analyze it. One idea several people around the lab have been toying with is applying these ideas to organizations one is a part of. Just like individuals can benefit from Quantified Self by gaining objective information about themselves, organizations may be able to similarly benefit. (We admit, our motivations mostly boil down to: data is cool and graphs are pretty.) The natural place to begin, of course, was with hacklab! So far, we have only worked with the doorbot data. Unless the door has been unlocked, entering Hacklab requires one to use a small fob, unique to each member. The program responsible for processing these, doorbot, will unlock the door if it detects a member. It also logs the entry in a database. 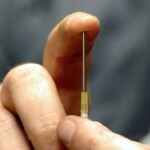 This is a valuable source of data about activity at the lab, but there are a number of ways in which it can be flawed. If a member works on a project on the side walk outside, they may enter and leave a number of times in a matter of minutes, but this doesn’t actually mean there was more activity. On the other hand, a member may enter along with another or on when the door is unlocked, making them invisible. Furthermore, Fob’s may be reassigned over time, and we have no way to know who the former owner was. The first concern is mitigated in the following data by considering only the number of entries by unique members each day.